Uneven stitches (the threads are not pulled evenly during the stitching process and this creates an uneven surface). Herringbones (created by working against the grain of the canvas). These are visibly noticeable from the front of the stitched piece. Tension that is so tight that it causes the stitches to bunch up and sometimes the piece will be completely out of shape. Dye-lot changes in the threads. Use a laying tool (a tool similar to a needle in its shape) or a needle to assist you with keeping your threads together as you complete a stitch. Prepare your wool threads for stitching (Tip: read more about this below). Be conscious of the position of your threads to make sure they are not twisted. If you are stitching a mono-weave canvas, the rule of thumb is to stitch in an ascending direction on a horizontal crossing and descending on a vertical crossing. Relax! 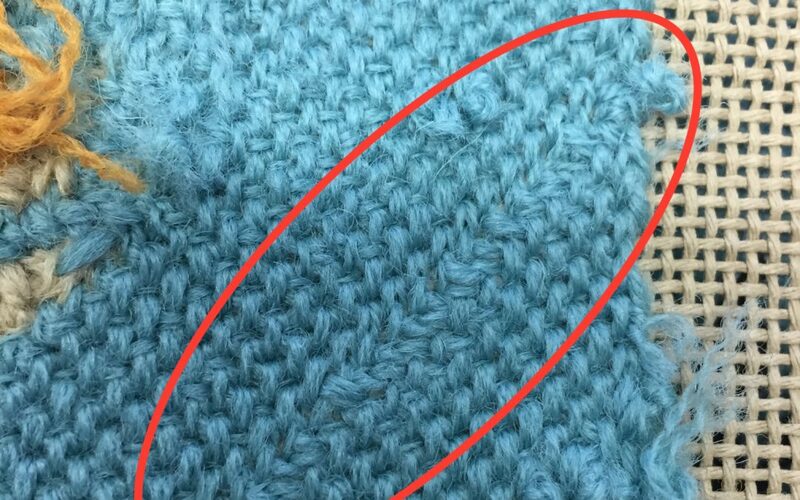 Gently finish the stitch and try not to pull too tightly. Use the appropriate needle size, one that is too large will spread the hole opening and that will close the adjacent holes. When using a frame it is easier to pull a stitch too tight because you are using both hands- “the poking in and out method”. Concerning yarn dye lots, if your yarn does not have a dye-lot number you can stitch a small sample from the different batches next to each other before using it on your piece. Or, blend the individual threads if you are using two, three or four-ply. Tips: Run your fingers along the strand several times to remove lose fibers. There is so much to learn! Our workshops cover a lot of detail so bring a notepad and don’t be afraid to ask questions.